Baja-style lobster is the specialty of Puerto Nuevo, Mexico, a small fishing village south of Rosarito. 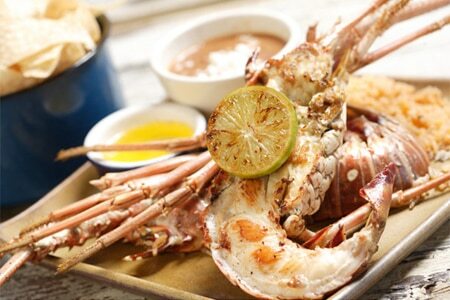 In the traditional preparation, Pacific lobsters are pan-fried and served with beans, rice and tortillas. For this delicacy without traveling south of the border, try one of GAYOT's Top Restaurants for Baja-style Lobster in San Diego, presented in alphabetical order. This dish is a seasonal specialty generally offered from October through March, so call ahead for availability.